One of the grand challenges for the European society in the near future is to adopt new technologies for delivering the needed sustainable energy solutions. 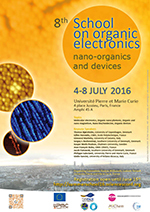 Hybrid and organic electronics appear as promising candidates. Thus we need well trained and educated young researchers on the various aspects of organics and hybrid thin-film interfaces and nanosystems, from fundamentals to applications. . The focus of the summer school is to give insight into organic systems at the nanoscale focussing on organic electronics, organic nano-photonics, nano-bio systems and nano-medecine, organic magnets, hybrids and organic devices. Experimental/computational techniques together with synthesis and elaboration strategies will supplement the topics. The summerschool will also propose transversal lectures such as innovative teaching methods or media and popularization of research based results, in order to help the young researchers in their prospective career.